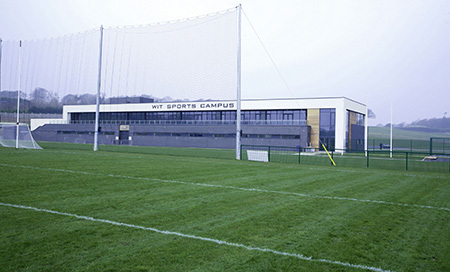 The first phase of the WIT Sports Campus project is now completed. The 50-acre development close to the Waterford city by-pass and outer ring road will provide a central and cohesive complex of sporting and recreational facilities for teams and individuals in the South East Region. Its location means that it is readily accessible from both the City and County and from the neighbouring counties of Kilkenny, Tipperary and Wexford. WIT Sports Campus amenity is strategically placed on the new bypass around Waterford City and this will mean that the site will be readily accessible to all users. This facility at Carriganore has the potential to implement three strategies; participation, performance and excellence by pursuing excellence in academic programmes and research and by providing inclusive facilities for the wider community. Third level Institutions have to be pioneers in changing Irish society for the better. WIT already has been to the forefront in providing personnel to help with the development of sport in Ireland. WIT has now advanced this trend by providing sporting facilities that the South-East can be proud of. These facilities will be widely used by all groups in the region and nationally. WIT can now become leaders and pioneers in sporting provision and health promotion for the benefit of the South-East region and to ensure that the region and institute maintains parity with other parts of the country. One of the main attractions will be the full size GAA floodlit all-weather pitch. The first in Ireland to pass the new GAA Standard for GAA Pitches. Waterford city has no all-weather pitch of a size that would cater for a GAA game and only two that are standard size for Soccer. It would serve the needs of WIT teams and also a variety of local juvenile, junior and senior teams. Performance (to create an environment that will facilitate the development of the individual’s sporting ability). By providing a facility that is inclusive and accessible to all within the college and the community we can deliver for the Institute, the southeast and the nation on thesestrategies. The uniqueness of this facility will allow the Institute to be a leader in the provision of sport and recreation in the 21st century.